Chinese families have been recording genealogy for nearly a thousand years. Their unique records may help you trace your Chinese ancestry into the distant past. What Chinese Genealogy Records Exist? Before people had tools to write their family lines in books, family histories were recorded on shells, bones, and even in bronze. Some people kept counts of their generations by tying small objects into knots on ropes. 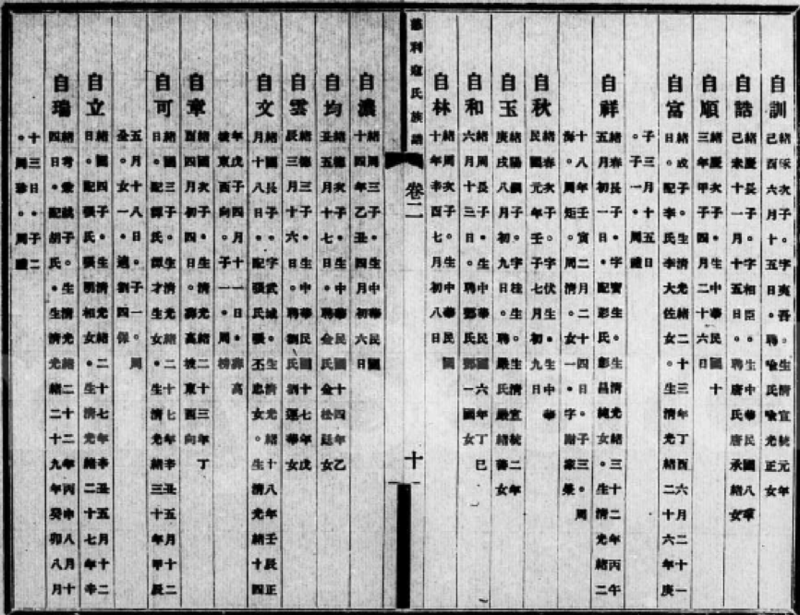 By the mid-1600s, Chinese genealogy began to be recorded in manuscripts called Jiapu (家譜) and broader clan records known as Zupu or Zhupu (族譜). Nearly all families in the Han ethnic group and many families in minority ethnic groups created these genealogy manuscripts. Those who reverenced their ancestors as part of their religious practice considered it critical to maintain these records. While wealthier families had more resources to preserve and print Jiapu, poorer and rural Chinese clans kept them too. From FamilySearch’s free China Collection of Genealogies: Kou surname in Hunan Province, Cili County, image 20. Today, about 85% of surviving Jiapu are publicly available but are scattered throughout libraries in Asia and the United States. These records cover up to a quarter of Chinese people who have lived since the 1600s. Some have been published as multivolume book series. The rest are mostly original manuscripts that remain in private family collections. Unfortunately, many Jiapu were destroyed during the Cultural Revolution of the 1960s and 1970s. What Is in a Chinese Genealogy Book (Jiapu)? Multiple given names and surname. Birthdate and perhaps birth order. Patrilineal lineage and nature of father–son relationships (adoption or biological). Education, professional accomplishments, and official ranks. Wife’s surname, her birthplace and death date, and her father’s name and his titles and honors. Death date or burial date and place. Sons’ names and perhaps birth order and mother’s name. While Jiapu can be rich in information, important details are often omitted. Daughters may be tallied by number or left out entirely, although occasionally you will find identification information for the husbands of married daughters. Relatives may be left out if they entered a monastery or behaved shamefully. Log into FamilySearch.org. If you don’t have an account, click here to create your free FamilySearch account. Go to China Collection of Genealogies, 1239–2014. As shown here, you will see a description of this collection and the option to view record images. Don’t worry—you don’t have to scroll through 13 million pages to get to the clans you care about. Click where it says to browse the images. A new screen will appear showing a long list of Chinese clans. Scroll down the page as needed to search for family names of interest to you. Click one. You may see additional options for the location of this family name. Click through to select the country, province, and county, and then the title and year. Use the image browser to page through the digital images (A), zoom in and out for better viewing (B), and maximize the image by going to full-screen view (C). If you need more assistance in navigating this collection, the FamilySearch wiki articles “China Research Tips and Strategies” and “Chinese Genealogical Word List” may prove helpful, as might this more advanced tutorial on how to read and understand Chinese genealogies. The House of Chinn website provides excellent English-language resources to help genealogists trace their Chinese family histories. Societies such as the Chinese Family History Group of Southern California and the Chinese Historical Society of America may have additional support and resources. See a more complete list here. The FamilySearch wiki has additional suggestions and strategies for researching your Chinese ancestry. Does the FamilySearch collection of Jiapu include any of your ancestral surnames? Click here to start exploring it for free.